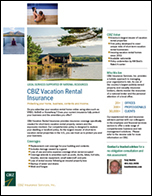 CBIZ Vacation Rental Insurance is offered to owners renting through professionally managed companies as well as other online sites such as AirBnB or VRBO. Ready to get a quote? It's fast and easy! All we need is a few pieces of basic information about your rental property and you'll be finished in less than five minutes. You can also contact our sales professionals at 888.883.5696 between 9 a.m. and 5 p.m. MST, Monday - Friday.